I am the Indian Elie Wiesel , jewish Holocast survivor died in July 2016, victim of German racism. Please support my nonviolent internet campaign appealing to people to boycott German cars that poison the air we breathe and products. German universities practise covert racism in permitting doctorate between British and Indian graduates despite extraordinary performance.British Universities treat Indian degrees as equal to their own. But Germans treat us as inferior! This is nothing but racism. Adolf Hitler also considered only the Brtish as worthy of his salt and the others ‘Untermenschen’ (subhumans). Many German Ph.Ds are copycats of research publications in English. Some of them even become professors in their universities or Defence Minister in the German Federal Government. They get away with this because German is their medium and their English is poor. Their nobel laureates are exceptions that prove the rule. See how they ruined the promising career of a young Indian researcher suffering from writers' cramps.Subjectively I feel like a holocaust survivor. The UNIVERSITY SANCTIMONIOUSLY OBSERVED UN-YEAR OF THE HANDICAPPED. I am the Indian Elie Wiesel, the jewish Holocaust survivor who died in July 2016. For my contribution Hyperstatic Method of Photoelasticity I have been named in US Publication Marquis 'Who is Who in the World 2010' and as one of the '2000 Outstanding Intellectuals of the 21st century' in IBC publication of Cambridge. Please boycot German cars whose exhaust poison our air and goods! Mercedes BMW Porsche Siemens Bosch! Many German Ph.Ds particularly from of Stuttgart are copy cats of Scientific Journals in English. Some of them become even professors in their universities! They get away with this since their medium is German and their English is poor. Their Nobel laureates are exceptions that prove the rule. Please spread this message world wide. In the German universities in general and in Stuttgart in particular British Bachelor graduates are permitted to doctorate (promotion) after a pass in oral exams lasting 30 minutes each in two main subjects and submitting a scientific work comparable to a German “Diplomarbeit”. Please see page Section 3 a & b of the university’s promotion rules in link prom.jpg attached. Graduates from non-white Commonwealth countries have to go through the whole tedium of the German Hauptdiplom scheme, whereby we mostly repeat in German what we learnt in English. Thereby many German Ph.Ds particularly from of Stuttgart are copy cats of Scientific Journals in English. Some of them become even professors in their universities! They get away with this since their medium is German and their English is poor. Their Nobel laureates are exceptions that prove the rule. Please spread this message world wide. Also in print October 2008 in Vol 48/5 693-696.
Who is Who in the world. receiving update sheets within 3-4 months after you pass the first part. is no need to submit another biography. In German universities in general and in Stuttgart in particular British Bachelor graduates are permitted to doctorate (promotion) after a pass in oral exams lasting 30 minutes each in two main subjects and submitting a scientific work comparable to a German “Diplomarbeit”. Please see page Section 3 a & b of the university’s promotion rules in link prom.jpg attached. Graduates from non-white Commonwealth countries have to go through the whole tedium of the German Hauptdiplom scheme, whereby we mostly repeat in German what we learnt in English. 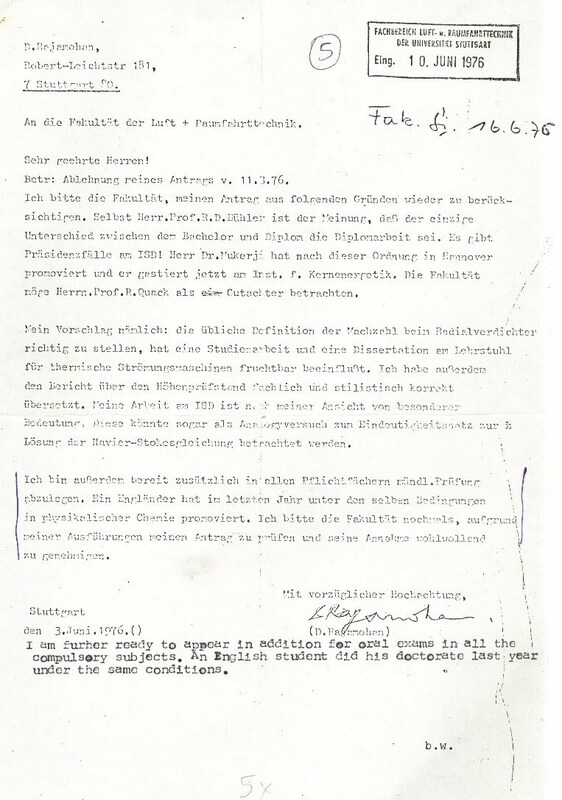 In 1974 I applied to take the Hauptdiplom examination. A month before the exam I had an attack of writer’s cramps and I could not write. The doctors who treated me said it was a psychogenic reaction probably caused by some incidents of racist prejudice shown by some university staff. I requested the university to permit me to do doctorate directly under the exemption rules cited above, since I could take oral examination. I was forcibly exmatriculated from the university on the ground of long illness whose end was not foreseeable. The University misrepresented some incidents so that the Govt.Doctor concluded that I am a psychiatric case. I underwent the humiliating experience of staying in the government psychiatric hospital for a week to prove that I am neither insane nor an addict. Prof.Dr.Spiegelberg not only faulted the government doctor's report but also subtly hinted that the University is to be blamed. Please see page2.jpg attached. One would think such things happened in a fascist regime. Pl. see also National Human Rights Commission of India at the end. The courts’ attention diverted to para 2 from para 3 of Section 3 of doctorate rules the clause for diplom graduates and lying to the court prevaricating justice - courts not applying their mind to the basic questions: "The British graduates are permitted to do doctorate after 2 semester study and appearing for two oral exams. Indians have to go through the tedium of their Hauptdiplom wherein we repeat in German what we already know in English. the university lawyer remains silent not refuting when my charge of perverting justice was first made in the lower court for the first time. See link : liar.jpg . He disputed before the court the oral promise by calling it alleged promise. I produced documentary evidence that in a written submission before the lower court in my case against exmatriculation he admitted that an oral promise was made. See page 1.jpg below. Still the administrative high court (Verwaltungsgerichthof, Mannheim) in its unfathomable wisdom decided in favour of the university. Perhaps the honourable judges could not digest the idea of an Indian beggar challenging a German university! The accusation of perverting justice in my position’s paper the court was handed over to Mr.Bollinger on 24-1-81. He had at least half an hour’s time to refute my charge. His voice became rather meek as he helped the lady judge to pronounce name correctly. The university itself conceded that I was orally promised that I could expand my work into a doctorate. This is also a case of breach of promise. 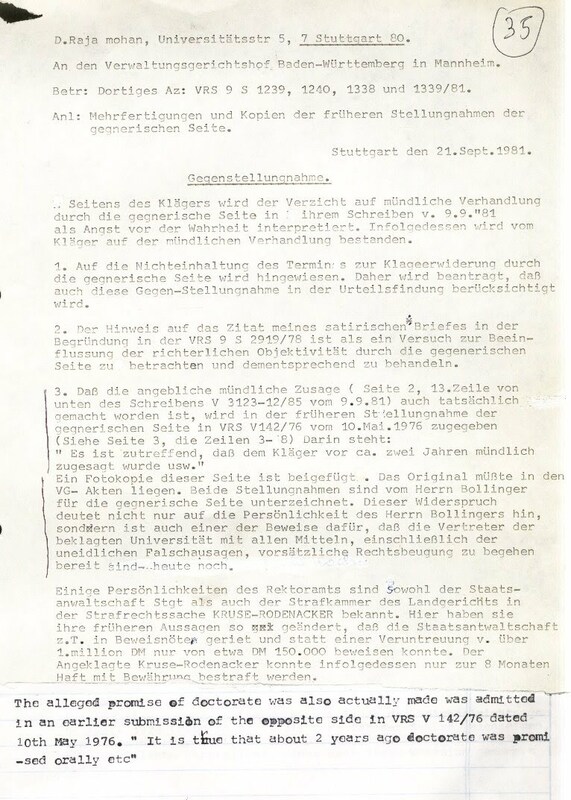 Please see link page1.jpg in its submission dated 10th May 1976 to Verwaltungsgericht Stuttgart. The university also states in the same breath that it is not a deciding factor whether I showed extraordinarily brilliant scientific qualification or not see: page1.jpg above. Perhaps one should be extraordinarily stupid to do doctorate in the Stuttgart University! It is well known in knowledgeable academic circles that many German Ph.Ds are copycats of scientific publications in English. Some even become professors in their universities. They get away with this since their medium is German and Europeans' English is poor. I was expelled perhaps because my work was rather too original! The same University lawyer Mr.Bollinger writes to the higher court of “alleged promise” (see link liar.jpg below). I pointed out the self contradiction to the High Court at Mannheim (link liar.jpg ). 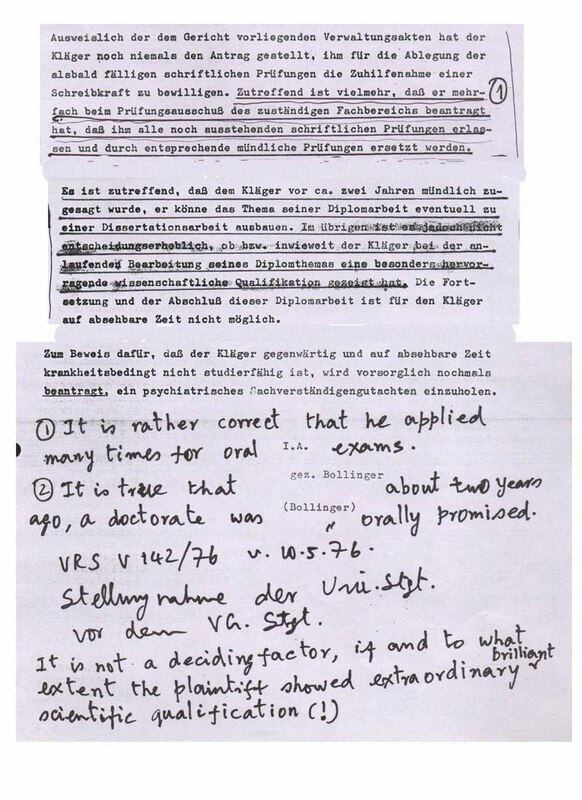 I also pointed out that Mr.Bollinger had at least 30 minutes in the court -Verwaltungsgericht Stuttgart- on 24-4-“81 to refute my accusation in the open court of the University perverting justice in my submission to the Higher Court (links page1.jpg and page2.jpg). But the courts would not consider this. Their attitude seemed to be “right or wrong it is our university”. I was shocked at this deep rooted hostility towards non.white foreigners in the German psyche. The University deliberately misled the court that I did not produce the equivalence proof although it was the university, which prevented that by refusing to give me oral exams in the first place. I said I would appear for oral exams in all the subjects not only two as required in the rules. 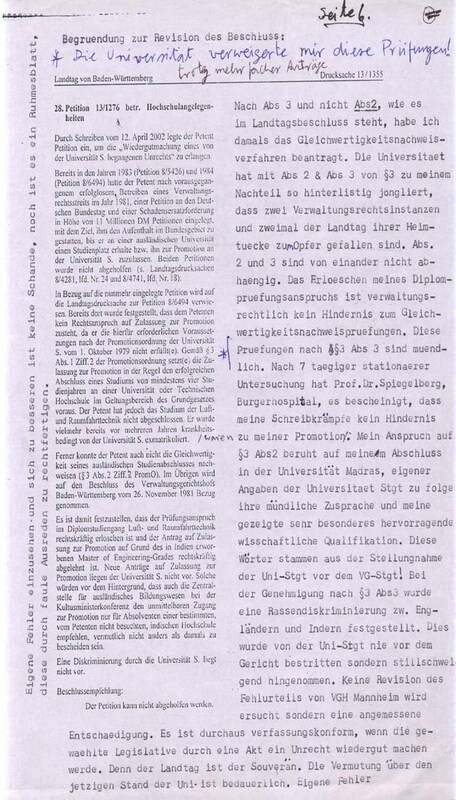 The Verwaltungsgericht Stuttgart overlooked the fact that in my submission dated 19th Sept"80 I pointed out to my appeal to the aerospace faculty dated 3.6."76. Please see file fac.jpg above in which I stated that I will take oral examinations in all the main subjects and not just two as required in the rules (2). 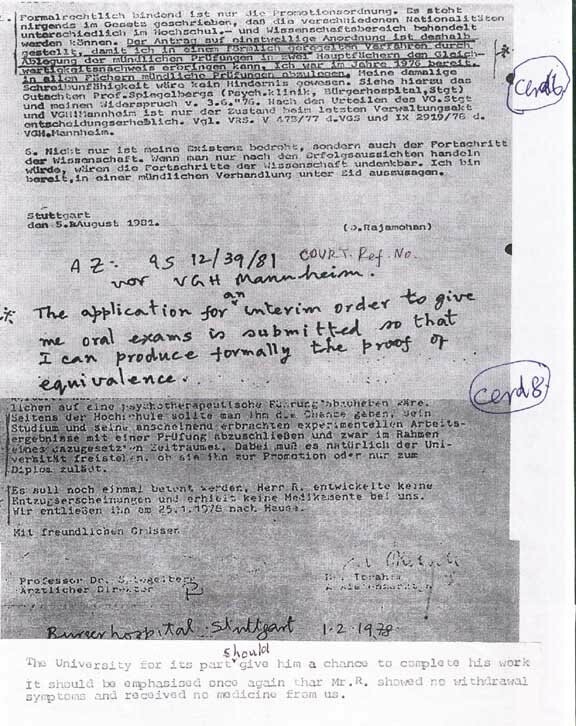 The High Court of Mannheim also erred similarly overlooking that in my appeal dated 5th Aug 1981. I once again requested the honorable court that I be allowed to take oral exams in two main subjects. Please see 'file.page2.jpg. The courts fell victim to the university’s contention that my right to exam lapsed after two years from the date of my exmatriculation as a diplomand. This argument is to be rejected, since even within this period I requested for several times for oral exams. Please see 'file.page1.jpg' last para last four lines in the University's submission dated 10th May 1976 in which the University itself admits that I requested the university several times for oral exams . Without giving me exams how can the university claim that I did not prove my equivalence? The honorable courts perhaps thought that the university like the Holy Father in Vatican is infallible, despite my submission that the Stuttgart University is no stranger to perverting the course of justice (Rechtsbeugung). One Prof. Kruse Rodenacker got away rather lightly with misappropriation of funds thanks to unsworn misrepresentation (uneidliche Falschaussage) by some of her officials. Please see links liar.jpg and page2.jpg below. I tried to get into some university but met with rejection since I did not have my certificate from Stuttgart and / or because of my struggle thought that I was a tough customer. Sadder but wiser I returned to India and I took positions as Principal (Director in private polytechnics) far below my capacity. After a few years I retired because the sad memories of injustice did not let me do justice to my position as an institutional head. The mental agony I suffered the loss of an intellectual life I could have led and above all the time lost can neither be regained nor compensated for. Subjectively I feel like a survivor of holocaust. If the world makes the German 'Establishment' realise once for all that they can not play the master race with poor people my suffering would not be in vain. To a petition I submitted in the year 2002 the Stuttgart State Legislature Landtag's concluding remark was "even today the university would not decide otherwise." It sounded like even today we would gas the jews. I solemnly affirm in the name of every thing I hold dear and sacred that the above statement is true to the best of my knowledge, faith and belief. University of Stuttgart, 70174 Stuttgart, Germany. ATTENTION HUMBOLDT DAAD SCHOLARS TO GERMAN UNIVERSITIES! YOUR RESEARCH WORK MAY BE PRESENTED BY COPYCAT GERMAN PH.Ds AND EVEN PROFESSORS AS THEIR OWN WORK BY TRANSLATING AND GERMANISING YOUR WORK. DON'T REVEAL EVERY THING AND PUBLISH YOUR WORK IN YOUR OWN NAME AFTER GOING BACK HOME. Their own “Historian concludes racism in Germany had deep roots . Racism is deep rooted in the German psyche. They seem to have forgotten their past amidst their present affluence. This can be remedied by the rest of the world only by reminding the Germans repeatedly about Holocaust and boycotting their cars and products. My case dates back by some thirty years. In reply to a recent petition the Stuttgart State Parliament replied to me “even today the university may not decide otherwise (!)”. It sounds even today we may gas the jews! Send your protests please !